As much fun as beekeeping and tours are, sometimes we like to let loose by inviting the community to swing by our hive for some free family fun! 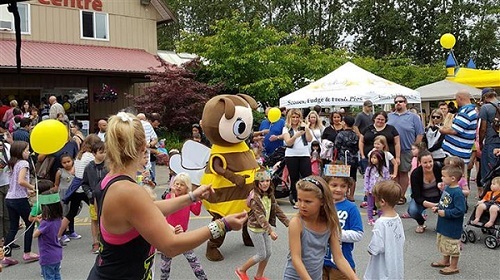 On Saturday July 14th and Sunday July 15th 10:00-4:00, our annual Honeybee Festival has become a classic, offering amazing and educational entertainment for everyone! Come join us rain or shine for Free fun family fun. experience the live bee beards, live music, face painting, bouncy castles and much more! We like to have a little fun when introducing the amazing honeybee to the general public. 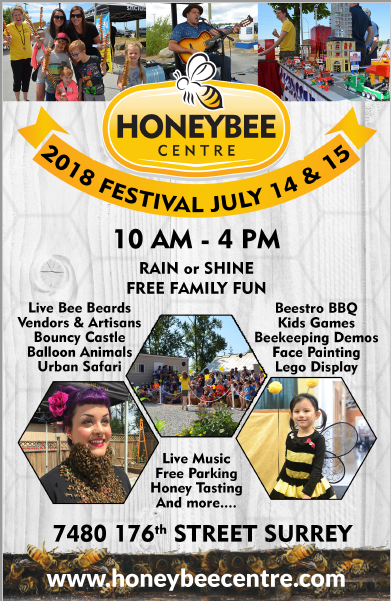 So we host our annual Honeybee Festival that features free entertainment and fun, including live “bee beard” and beekeeping demonstrations, kid’s crafts and activities, musical entertainment, interesting exhibits, fresh local produce, and the wares of local artisans. You can sample up to 20 varieties of honey, watch honey being extracted, and even taste freshly extracted honey! We also take our “show on the road” and participate in a number of community activities, including operating the honeybee exhibit at the PNE, and providing natural honey products at the Vancouver Christmas Market. If you love fun (and we have a feeling you do) you’d be crazy to miss the excitement we offer with our free family festivals! Sure, we offer face painting, concessions, and live musical entertainment like any of your other favorite community events – but, of course, here at Honeybee Center we love to go that extra mile….